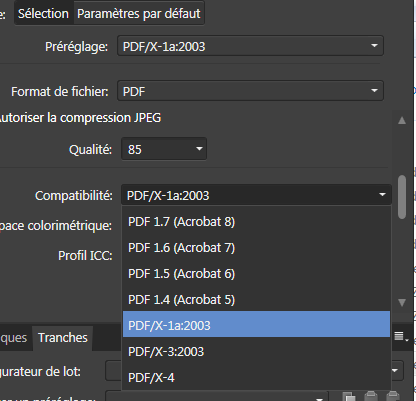 Please, i need to export my works in PDF version 1.3 (Acrobat 4). This is the only reason I still use Photoshop instead Affinity Photo. Unfortunately local italian printers require this PDF format. Can You integrate this PDF format? Perhaps you need to search more about PDF options and learn how to parameter your programs. And ask more informations from your printers. PDF version 1.3 (also called PDF/X-1a:2003) is an option in the PDF export settings. You'll have to select the right parameters (ask more details from your printer needs) and right ICC profile, and save the Exportation profile for later use. There's no lower settings for PDF (those settings are the same we use at work for printing a lot of magazines, this avoid transparency and some problems). I added a screeshot from inDesign options (I did mostly — no bleed, no print marks, for import in other apps — the same settings in Designer/Photo, and our fabrication team validated it). But there's a lot of points to check for a PDF, as in minimum stroke width, fonts (embedded, copyright…), images' resolution (clients often send us PDF with low resolution images embedded), spot colors, etc. Can you check your file with Adobe Acrobat preflight or some program like Pitstop ? (Serif's PDF pass our "Pitstop test"). Or know someone who can do it for you ? The screenshot you did show a list of requirements needed, but doesn't show your problem, or list them as in a Pitstop's log, so you can correct them. And I can't help you with a free software or online preflight test, since I usually do it at work with Adobe Reader pro or Pitstop. 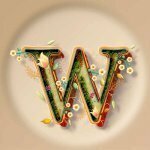 Perhaps someone can help about this ? Oups, @Altod I forget to ask : there's no log you can get from this page to know exactly what is the real problem ? the real problem is that i need a PDF file version 1.3 (Acrobat 4) to send it to the printer system. PDF/X-1a:2001 – such a file has to be a PDF 1.3 file. PDF/X-1a:2003 – such a file has to be a PDF 1.4 file but it should not contain any transparency and JBIG2 compression should not be used to compress images. 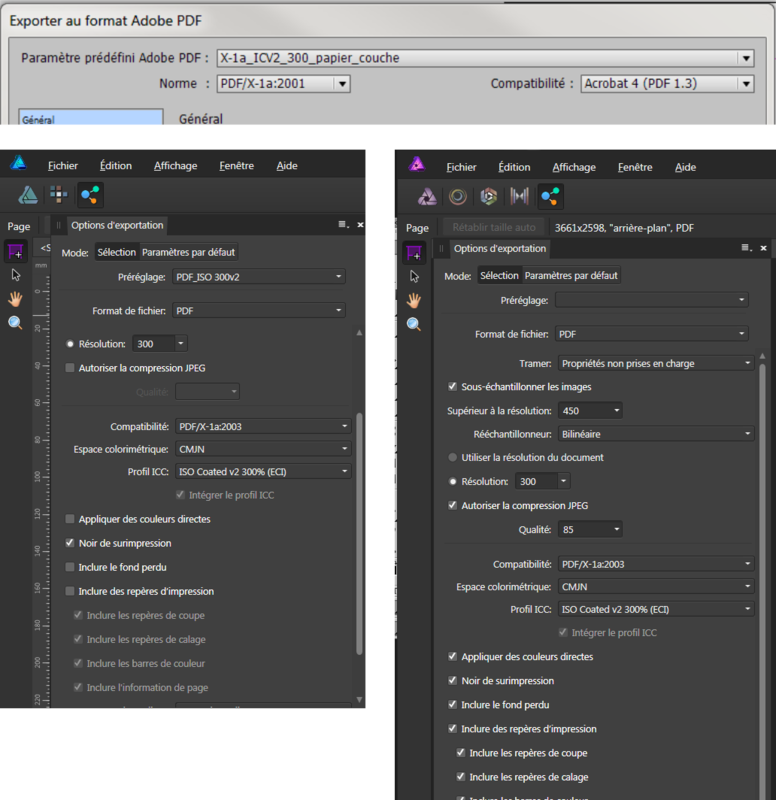 So, i think i need PDF/X-1a:2001 setting to save PDF file 1.3, but Affinity Photo doesn't have this feature. 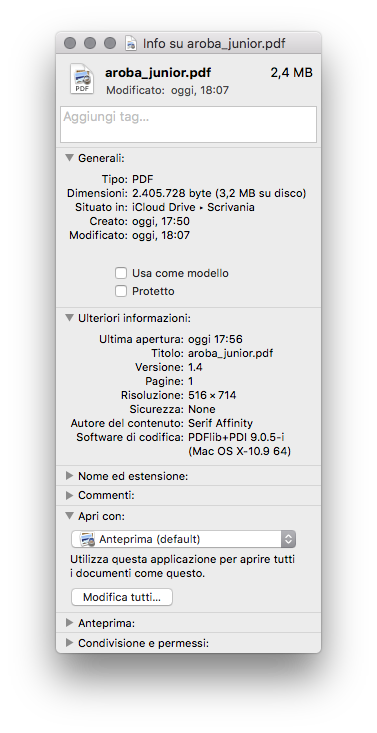 With Affinity you can create PDF 1.3 (acrobat 4) files with options PDF/X-1a-2003 or PDF/X-3-2003, files that won't allow transparency and avoid problems. Those are similar to inDesign parameters, and I expect your printer to allow files made with this application (cf. screenshots). I suspect some other problems with your file than as listed in the screenshot you did. Is the profile in the link provided a profile you can download and install for exporting PDF? Now, if you want to try to convert your file to PSD and convert this PSD to PDF, be carefull and give it at least 600 ppp resolution (I'm not sure texts and graphics will stay as vectors doing those conversions), so the printed result — especially fine text — stay crisp. Doing this for images containing text/details will give a better result and less blur. “As chairperson of the ISO PDF/X Commitee, I'll confirm Bob's response. Officially, PDF/X-1a:2003 (as opposed to PDF/X-1a:2001) is based on PDF 1.4 with the restriction that live transparency cannot be used. Note that the specification doesn't prohibit use of PDF 1.3 or earlier for such a file! In order to technologically fit into how InDesign and other CS applications “work,” PDF/X-1a:2003 export is done using the PDF 1.3 standard such that live transparency does not appear in the resultant PDF/X-1a:2003 file. Ironically, PDF/X-1a:2003 never really caught on with the print industry. Most print service providers that request or support PDF/X-1a, specify or imply support for PDF/X-1a:2001. Note that in reality, PDF/X-1a and PDF/X-3 really represent the best of 20th century print publishing workflows, not workflows that need to deal with very graphically-rich content with transparency. Adobe most strongly recommends PDF/X-4 direct export from InDesign (and save as PDF/X-4 from Illustrator and Photoshop).